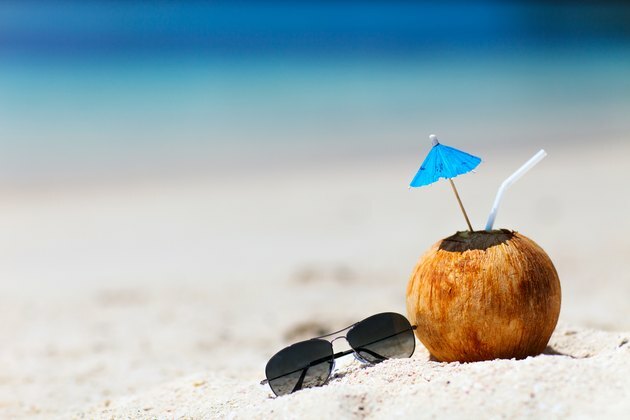 Coconut juice comes from the belly of young coconuts. Sometimes referred to as coconut water, coconut juice provides an impressive amount of nutrition and benefits your overall health. The best source of coconut juice is young coconuts. In the packaged varieties, pasteurization kills harmful microorganisms and helps preserve the coconut juice, but it also destroys many of the health properties and essential enzymes. A 1-cup serving of raw coconut juice contains 46 calories, less than 1/2 gram of fat and 2.6 grams of fiber. Not only is this a low-calorie, low-fat beverage, but it also provides important electrolytes, such as 600 milligrams of potassium and 252 milligrams of sodium. For optimum bone health and muscle recovery, you get 58 milligrams of calcium and 60 milligrams of magnesium. Coconut water contains water-soluble vitamins B-1, B-2, B-3, B-5, B-6, B-7 and B-9 that act as coenzymes essential for cellular function. The bioactive enzymes such as acid phosphatase, catalase, dehydrogenase, diastase, peroxidase and RNA-polymerases in coconut juice aid your body with digestion and metabolism. A study published by "Molecules" in 2009 uncovered the chemical composition and biological properties of raw coconut water. Of particular interest are the cytokinins, which are responsible for cell division and rapid growth. One particular cytokinin, called kinetin, had anti-aging effects on human skin cells and increased the life span of fruit flies. Another study published in the journal "Oral Surgery, Oral Medicine, Oral Pathology, Oral Radiology and Endodontology" in 2008 demonstrated the benefits of cytokinins for preserving avulsed teeth, which is good to know if you ever lose a tooth unintentionally. One of the main advantages of coconut juice is its ability to help your body recover after working out or excessively sweating. The "Journal of Biological and Chemical Research" published a report in 2013 on the health benefits of coconut in Asian cuisine. The report refers to coconut water as a natural energy or sports drink. This is, no doubt, due to the beverage's high electrolyte, magnesium and calcium content. The small amount of sugar in coconut water is necessary to help your muscles recover after a strenuous workout.